You are amazing! Once again, it just took a few weeks before all IFF tickets were sold out. If you are still waiting to hear back from us regarding your ticket request, we must share that it is very unlikely that you will be receiving a ticket at this point (we wish we could you fit all of you in!). Because this is the first year that we are implementing the IFF Ticket system, we are asking all of you to check the status of your ticket prior to booking your flight and accommodation. Every year since the launch of the IFF, the registration numbers have increased considerably. Last year marked a milestone, when we reached capacity in just four weeks and had over 1,000 people on our waitlist. 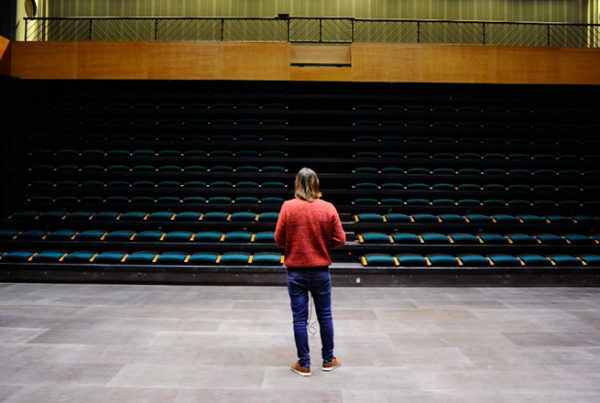 It was time to redesign our registration process in order to accommodate the increase in demands, while maintaining the diversity and inclusivity of participants, which is a staple of the festival. Individual Ticket: 100% sponsored and free of charge. Solidarity Ticket: Pay what you want. Organizational Ticket: USD 850, for individuals whose participation is covered by their organization. 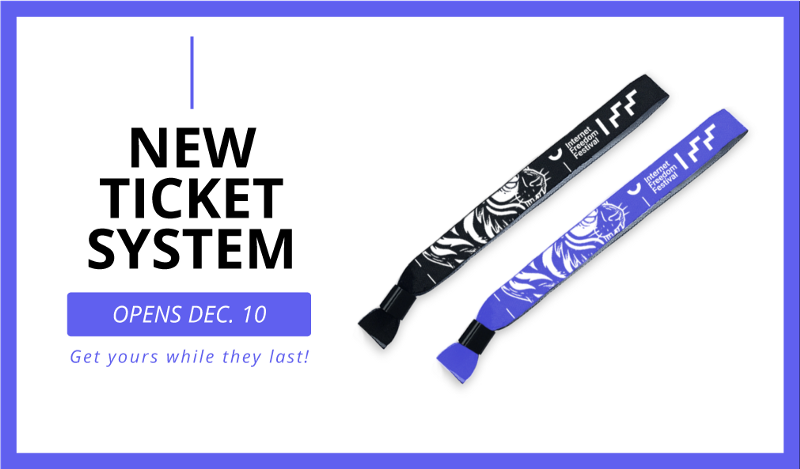 We have sent early invites to our fellows and partners to test out the new system, and everyone will be ready to request their IFF Ticket from December 10. Each IFF Ticket request will be reviewed individually. Approval will be based on our goals for diversity and security. While we are working hard to minimize reviewing and approval times, it may take some time before you hear from us. If you need to obtain a visa in order to travel to Spain, we encourage you to ping us at team@internetfreedomfestival.org after your request is submitted. Mark your calendars: Early IFF Ticket requests have a higher chance of being accepted! 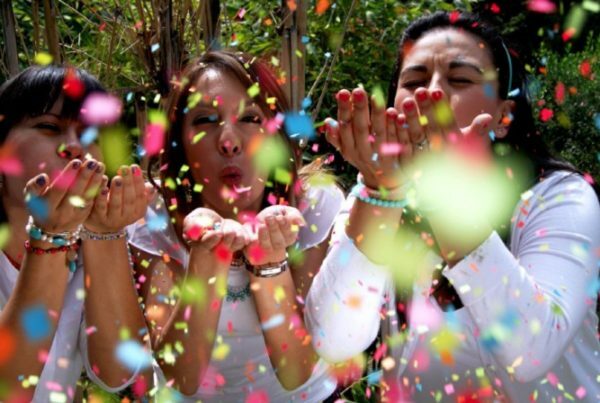 Get your IFF Ticket in 3 easy steps! If you are already a registered user, you can skip ahead to the next step. You may be asked to update your profile first. In that case, you will an “Edit Profile” button instead, as seen below. Once your profile has been updated, you will be able to see the “Request IFF Ticket” button. Once you have requested your 2019 IFF Ticket, you will receive an email confirming that your request was submitted correctly. Pro tip: Early requests have a better chance of being approved! After completing the short IFF Ticket form, you will receive an email confirmation. 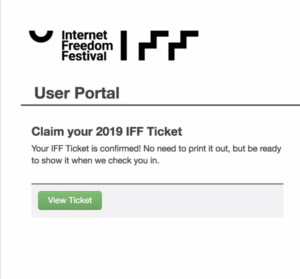 You will also be able to see your IFF Ticket information in your User Portal. 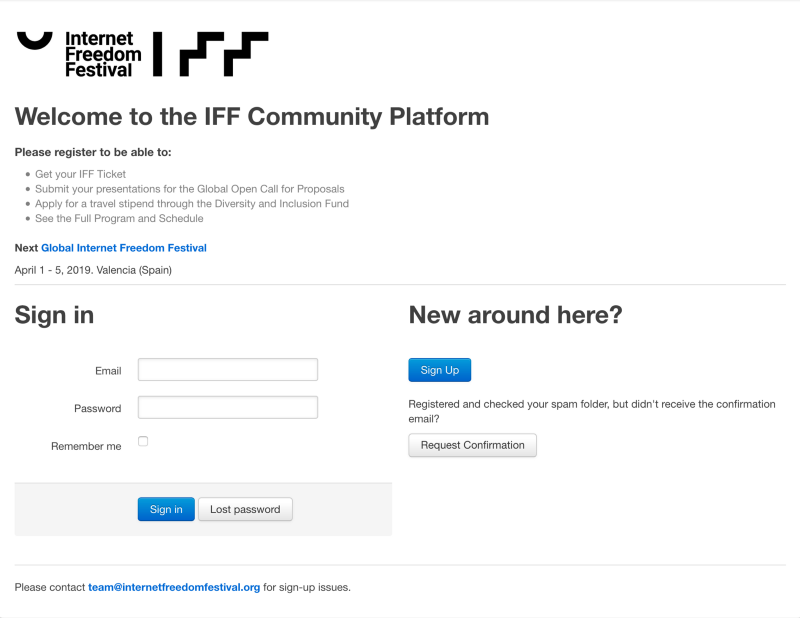 I’m already registered in the platform, can I attend the 2019 IFF? Creating a user in the IFF Community Platform does not equate to owning an IFF Ticket. To attend the 2019 IFF, you’ll need to request an IFF Ticket, as instructed above! How can I request an IFF Ticket? Will all IFF Ticket requests be answered? Starting December 10, IFF Tickets will be openly available for requests. Due to the volume of requests, only approved requests for tickets will be notified. Remember that early requests will have a better chance of being approved! Who reviews the IFF Ticket requests? All IFF Ticket requests are reviewed by the IFF Team to ensure that the event is inclusive and diverse, and that voices from various regions, fields and communities are properly represented. Each request will be reviewed individually, with special attention paid to applicants involved in projects fighting online surveillance and censorship, and those who belong to groups experiencing online surveillance and censorship. When approving requests for tickets, we will also be making sure new voices are brought into important Internet Freedom community conversations.